Delight your senses as you smooth your skin with this rich, exfoliating sugar body scrub. Made with luscious coconut and lime extracts and enriched with vitamin C and natural oils to soften. 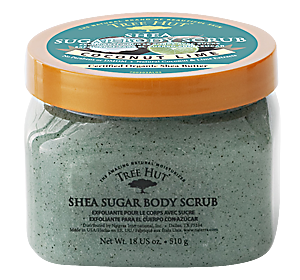 When I think of Tree Hut’s Shea Sugar Body Scrub, two words immediately come to mind: Mmm! Ahhh! Do those qualify as words? I have been using this brand’s body scrub as part of my regular beauty routine for the past few years. I’d came across this wonderful body scrub for the first time perusing the aisles of Walmart’s beauty section. At the time, I was a starving student and I’d just moved from California into my new apartment in Washington, D.C. I needed to find something to smooth and exfoliate my skin. My skin had changed while in California and was alot dryer and seemingly duller than normal because of the west coast climate. The Brazilian Nut “flavor”caught my eye and enticed by it’s contents (Key Ingredients: Brazil Nut Oil, Safflower Seed Oil, Evening Primrose Oil, Avocado Oil) & the price (at the time just $4.97), I picked up Tree Hut’s body scrub thinking I’d give it go. From the time I opened the lid and the delicious, sweet & buttery fragrance wafted around in the steamy bathroom, I was in love. I saw more radiant and hydrated, glowing skin from the first use. I believe that it took everything in me not to taste it because it certainly smelled edible. Tree Hut offers a great variety of fragances in the Shea Sugar Body Scrub–all of which sound absolutely irresistible. I discovered this brand nearly 5 years ago, I felt like I’d struck gold with this one and I definitely must say that I will continue to use it for many years to come. What else is so sweet about Tree Hut Shea Sugar Body Scrubs? This is a Paraben-free product and they do not use DM DM Hydantoin. They never test on animals and they use 100% Certified Organic Shea and other naturally derived ingredients. Tree Hut’s Shea Sugar Scrub is only intended for external use on the body–it is not to be used on delicate facial skin. Scrub entire body (about 3 or 3 times a week) with the Sugar Scrub to slough off dead skin and reveal radiant, glowing skin.